Get with the times, content is not king. In 2018, targeted content is king! But what is it? And how do you use it? In this article, we're going to discuss the buyer's journey and how to use targeted content that solves B2B customers' problems. What's the B2B Buyer's Journey Map? How Will Content Solve My Customers' Problems? How Do I Target My Buyer Personas? What Content Should I Create and When Should I Send It? Want to Solve Your Customers' Problems? Make a Strategy! Awareness (Top of the Funnel) - The buyer is aware they have a problem but don't know you're the solution. They'll start to research what they need, so you need to make sure you're what they find. Consideration (Middle of the Funnel) - The buyer is starting to define their problem and look at specific solutions. Ensure you've got the right content to answer their questions. Decision (Bottom of the Funnel) - You're now coming to the end of the buyer decision making process as they start to consider their vendor. You need to ensure your content educates them about your product, so they're more likely to choose you. Buyer’s Journey Example: Buyer’s printer keeps breaking (Top) buyer searches for reliable printers (Top) buyer looks at reliable printer reviews (Middle) buyer goes with most suitable choice (Bottom). Remember, this is the journey in its purest form, and other factors contribute to a decision. The buyer's journey helps us to understand basic B2B customer needs, but we need to delve deeper for more insight. The B2B buyer's journey map is a method that gives meaning to the buyer decision making process. Visualise your content pages as locations on a map, as visitors travel to each location they create a digital footprint. As your buyer passes through the funnel, they become aware, knowledgeable and curious. They'll read problem-solving articles, watch video guides and enter personal information for premium content. As you track their journey, you've got the opportunity to understand what they're looking for, and where they are in the buyer's journey. Make this journey as straightforward and fluid as possible as losing their attention creates undesirable hurdles. There's a simple formula you can use to get that information. That formula is the 5 W's, for those who don't know what that means, it's who, what, why, where and when. All great stories have these five elements, so if you want to create amazing buyer stories, you should use them in your buyer personas. Profiling your customers allows you to collect information about their wants, needs, pain points, and any questions they might have. Think about the last time your business bought something. Why did you need it? What were your pain points when finding it? What questions did you ask? Knowing your buyer is the most important part of the journey. If you don't know who your customers are, how are you going to sell anything to them? It's important to remember that your buyer may not be one person, especially in the B2B buying process. A business owner may have an idea and conduct some initial research, then delegate the next stage to a director. With this in mind, you should create several buyer personas. Think about the structure and size of the organisation and the roles of researchers and decision makers. As you build these personas, you'll get a loose representation of who your customer is. Use our buyer persona template as a guideline. Why is your buyer reading your piece of content? What problem are they trying to solve? If you can pinpoint problems, you'll be in an ideal position to provide the content that solves them. For example, your customer is an IT company that struggles to keep skilled employees. How can you solve that problem for them? Consider creating a blog post about negotiating better salaries and finding loyal talent. They read it, and their intrigue leads them to contact you for some advice and guidance. Take a customer-centric approach and look at things from the buyer's perspective. We've discussed what the different stages of the buyer's journey are, but how do you know which stage your buyer is at? We know that buyers will have problems and want answers to questions, which will be different at each stage. For example, you notice a leak coming from your car engine and start to ask why that could be (awareness). You conduct some research and find out a part of your engine needs to be replaced (consideration). You make calls to several different garages and get your car booked in for repair (decision). At the start of their journey, they may not know anything about the engine part that needs to be replaced. Fast forward a couple of weeks, and they know that the oil engine filter needs replacing. They’ve looked at oil filter repair kits, videos and guides. However, they decide that the problem is too technical so they look for a garage. Analysing the buyer decision making process will help you move them to the next stage of the journey? Can you entice them with an offer? Give them more insight? Developing an inbound marketing strategy helps you determine what content is appropriate for each stage. Where does your buyer find information? This part of the journey has a broad scope, but it's possible to narrow things down if you conduct enough research. Do your audience hang out on Facebook? Do they spend their evenings looking at gifs? What influencers do they follow? There are so many channels and platforms where you can distribute information, so you need to get this right. If 90% of Instagram users are under 35, you wouldn't focus your attention on that platform if you're a retirement broker. What are your buyers consuming? Different pieces of content relate to different stages of the buyer's journey. If your buyer is in the awareness stage, a simple blog post can give them more information about their topic. As they progress to the consideration stage, they may watch videos about the pros and cons of a service. When they're making a decision, they might ask for a training session, so they know how to use the product. We’ll talk about the type of content that should be published at each stage later on. Use the 5 W's to create one buyer persona. Think about how their journey would map out. And don't forget to use our buyer persona Template! Developing buyer personas and journey mapping lays out the theory to understand B2B customer needs. But how do you put it into practice? Prescriptive content that lays out a formula for success was the most popular type of content among B2B buyers in 2017, with 97 per cent citing it. In other words, be confident you can solve people's problems and give them the formula to do it. To get the best results from your content, you need to tailor it to the right person at the right time. Use your buyer personas for content ideas. 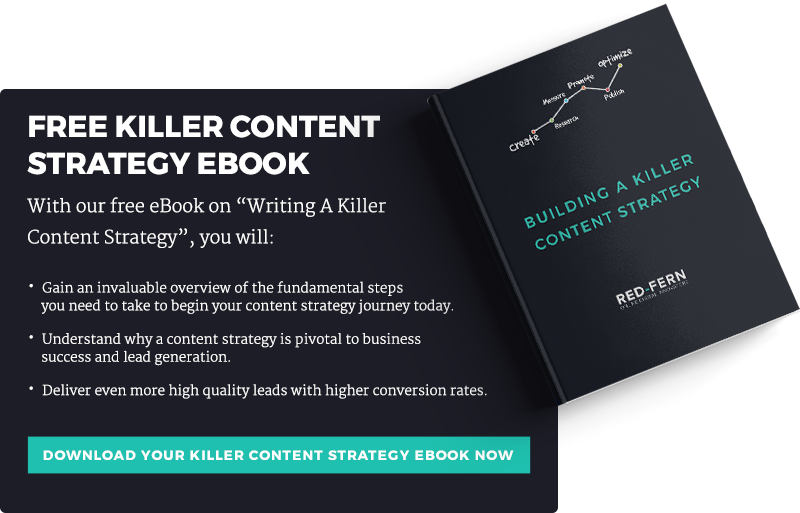 Tailor your content to the industry and buyer you're targeting! You can use the buyer's journey as a framework to determine what type of content you should distribute at each stage. Blogging is one of the best ways you can use targeted content to push your customers down the funnel. 47% of buyers viewed 3-5 pieces of content before engaging with a sales rep. (Demand Gen Report, 2016). It's a great way to educate your customers, and its usability is unrivalled, infographics, videos, pictures, quotes, you can insert them all! Search engine optimisation makes your content more accessible to potential customers. Awareness stage example: The Content Marketing Institute has an SEO checklist on Pinterest. This details all the requirements you need in a blog post, so it appears in search engines. Your customer knows who you are and they've provided you with their email address. This is where it gets personal. Emails are fantastic for leveraging and promoting content at the right time. Email contacts have already shown interest in your company, so you need to nurture them into buyers. Email campaigns are easy to track and don't cost a lot to run either. Get creative and make yourself stand-out. Consideration stage example: If people aren't opening your emails, why keep them on your list? HireVue took that statement and re-packed it into something fun, asking inactive contacts if they wanted to remain on their email list. Some left, but the people who stayed engaged better than before. Result! You're in the final, and your customer is about to make their decision. How can you improve your chance of winning? Client testimonials are a great way to secure a sale as they show your potential customer what you've achieved with a current customer. They allow you to back up the stat or benefit you've been telling your customer by selecting the most relevant choice. Remember to refer to your buyer personas and try to get video content where possible. Decision stage example: Head over to HubSpot's case study page. You'll find examples that split into various categories, as well as review and testimonial pages written by clients. Quick Brainstorm: Looking at the examples above, who are they aimed at? Who would their buyer persona be? When you have a problem, you want a solution. Immediately. How often do you lead with the solution rather than analyse the problem? 'We need more web traffic', 'we need more content on our website'. Have you considered the 5 W's before you tell someone the solution? What type of content do you need? Who do you want to attract to your website? It's all about working as a team to find the right solution. If you analyse a problem from all angles, you'll be better educated to give answers. This knowledge will make it easier to notice your customers' problems and solve them, making you a favourite in the buyer decision making process. Specific - You want to drive more of your 'Type 1' buyer persona to your site as they have high levels of company capital to spend. Measurable - How are we going to measure it? Sales? Leads? Traffic? Achievable - If we publish two blogs a week we'll be able to achieve our goal. Realistic - This strategy ties in with our organisations bigger goals. Timely - We can achieve this goal by 'x' date.